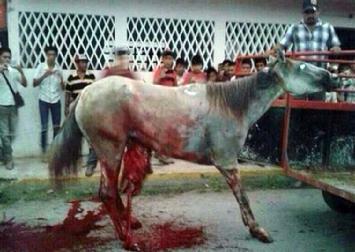 Several times a year in the Yucatan Peninsula of Mexico, trained bulls ram, gore ad kill horses for "fun" in a sadistic festival Spectators whoop and holler as bulls gore horses. 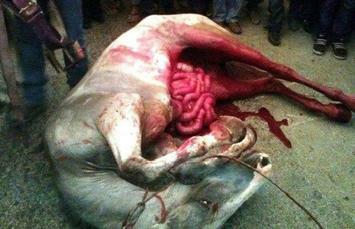 Then the poor horses guts spill out and he collapses in agony. 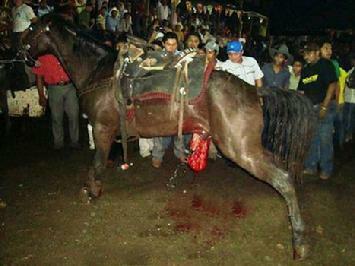 Since the gored horse if frequently unable to move due to shock, he dies a slow, painful death as he's trampled by bulls and other horses running for their lives. Even though this horrific "sport" is technically illegal,corrupt local government officials look the other way. What you can do - make your voice heard. Let's let the US Ambassador from Mexico know that we KNOW this is happening and US Turista's and our valuable dollars won't be visiting until it stops! Click here for a downloadable petition. Please sign it and send it to the Ambassador. The address is on the petition. Pass the word and the petition to your friends and family. 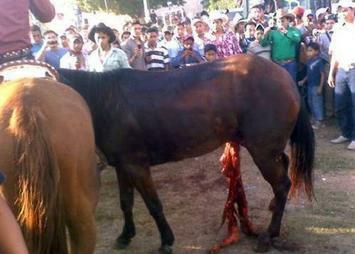 You can help save horses from this horrific fate!